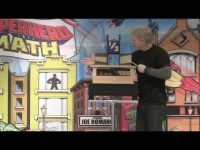 Multiply your student’s excitement for math in a fraction of the time with the addition of this exciting new math show! Joe Romano cuts his arm in 3 equal pieces to teach the concept of thirds. Students have to guess how many prizes are in the magic gumball machine, a great lesson in estimation. Other segments include Orders or Operation, Measurements. Area and Volume, Fractions, Probability, Estimation, and Place Value.